Isabelle Lafrance, a member of Immaculate Heart of Mary Parish Youth Ministry Program in Auburn, left, listens to Deacon Denis Mailhot, parish outreach coordinator, talk with Sister Pauline Bonenfant, 99, at Bolster Heights Health Care Facility in Auburn on Tuesday morning. 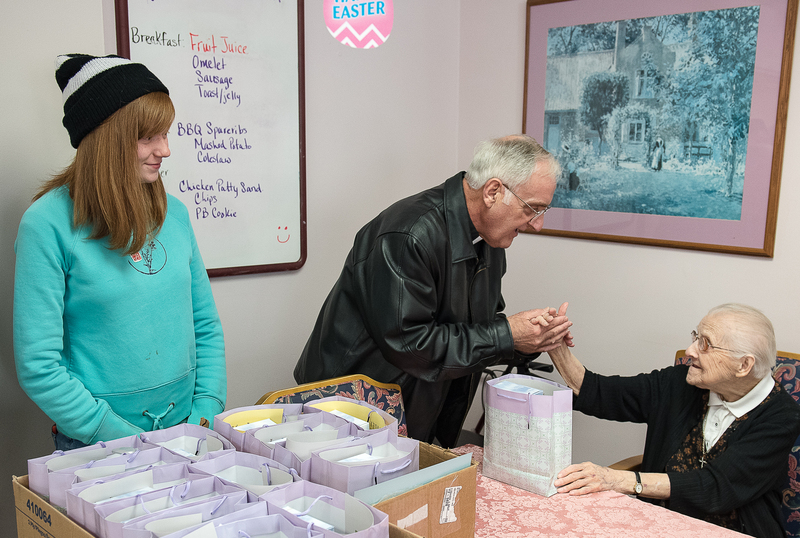 Lafrance and her brother Abraham delivered Easter gift bags to Bonenfant and other residents to cheer them and have the youths give back to the community. Bonenfant’s eyes lit up when she saw Mailhot enter the room, because Bonenfant was good friends with Mailhot’s mother who was part of the Dominican Order that taught locally.